The framed photographic honour roll commemorates those who served in World War One. The Strathkellar Hall was crowded to the doors on Wednesday evening when a highly successful concert in aid of the Red Cross funds was held, and the unveiling of a handsome honour roll containing the names and photographs of Strathkellar's accepted volunteers was unveiled. The chair was occupied by Cr. A. K. Walter. Apologies were read from the Ven. Archdeacon Harris, the Very Rev. Dean Shanahan, and Revd. R. C. Foyster and Mr. J. Lucas, all of whom regretted being unable to attend. Mrs. W. Brown, of Strathkellar, four of whose sons have enlisted, unveiled the honour roll, the audience rising and singing the National Anthem. The honour roll consisted of the photographs of the soldiers in a massive frame, the latter being made by Mr. J C Sedgwick, of Hamilton, the material used was Australian oak and the beautiful grain of this timber was shown to perfection. 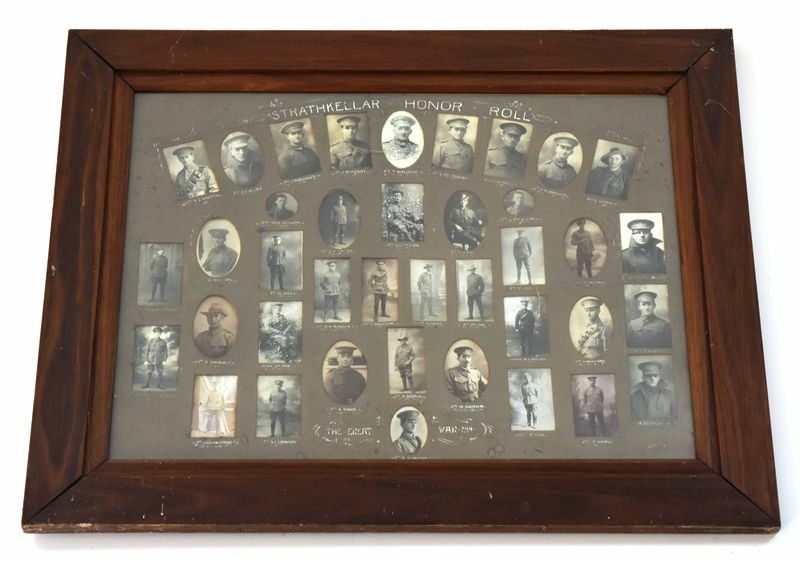 Messrs Johnson and Co., arranged the photographs in a pleasing manner, and the name of each soldier was artistically written in. At the top of the roll was the inscription "Strathkellar Honour Roll" and at the bottom "The Great War 1914." The roll was greatly admired for it's beauty and fine workmanship. The chairman said he was proud of Strathkellar, as out of 37 eligible men 35 had, without persuasion enlisted. Out of that 35, he regretted to say four had paid the supreme sacrifice. At this announcement the audience stood in silence as a mark of respect. Excerpt from Hamilton Spectator (Vic), 9 June 1917.